Video editing used to be a long and complicated process, but today recording and editing a short video with your Smartphone is as easy as taking a selfie. A growing number of apps also offer royalty free music so their users can create perfect lip-sync videos. These apps enable you to be a part of a community of short music video creators and to produce entertaining videos in which you dance and sing to your favorite songs. If you want to become a part of this thriving community, but don't know which app to use, you've come to the right place, because in this article we are going to introduce you to some of the best apps for making music videos on iOS and Android smartphones. A short while ago TikTok and Musical.ly merged into a single app that lets you create lip-sync videos effortlessly. The app grants you access to a sizeable music library where you can find music from Pop, Rock or R&B genres, so you just have to browse through it and select the song you like and hit the Record button afterward. The TikTok's video editing features include easy-to-use cut and trim tools, duplicate video and merge options that allow you to have complete creative control over the footage you record. In addition, you can add visual effects and stickers to your videos and if you decide to go live you'll be able to use some of the live streaming filters. 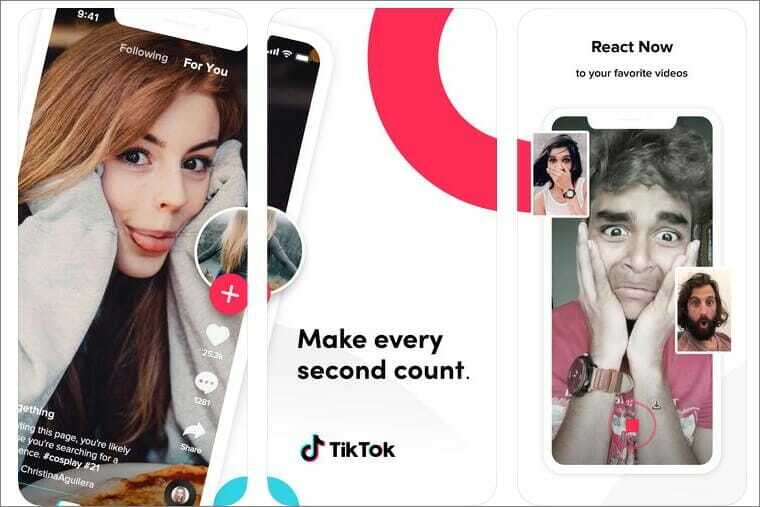 Besides being a solid video and music editor, TikTok Including Musical.ly is also a social network that has millions of users. You can browse through music videos posted by other creators on this platform and find inspiration for your next project. Making lip-sync videos with this app is easy, but you must use your own music since the Video FX Music Video Maker doesn't offer royalty free music library. You can either use an MP3 file or record your own voice to make the soundtrack for the video. The app offers advanced video recording options, so you can pause and resume shooting at any moment or use the Start Timer option to give yourself time to prepare before the recording starts. The newly added Stop Motion feature enables you to animate your music videos, while the Fast Motion recording mode allows you to speed up all movement in the video. Video FX Music Video Maker features more than fifty effects that can help your videos stand out. The app's file sharing options are more than decent as you can share videos on Facebook, Instagram or TikTok Including Musical.ly directly from the app. Focus on your performance and let the app do the rest for you. You can dance, sing or act goofy in your music videos and Triller will edit your videos automatically. If you want, you can also use the app's trim or cut tools to remove any part of the video clip you don't like. The only downside is that music videos you record with Triller can't last longer than 30 seconds. The app's music collection includes some of the most popular songs at the moment, so you can even participate in different music challenges or create lip-sync videos with music from your favorite singers. Triller lets you draw over videos, apply different visual effects or add text overlays, but some of these features must be purchased, as the free version of the app offers only a limited amount of ways to edit music and video. You can learn how to make music videos with Video Star in a short period of time, even if you never recorded or edited a video before. Just select a song from your music collection and start shooting. You can record your videos wherever you want, although you should avoid making videos in dimmed rooms since the lack of light may drastically decrease the quality of your footage. The process of editing a video with Video Star is fun because you can trim or cut your videos, clone yourself, make stop-motion animations or slow-motion videos. However, purchasing power packs, or opting for a monthly subscription is necessary if you want to gain access to all of the features the app has to offer. You can save your videos to your camera roll or share them to your social media accounts directly from the Video Star video editor. This unique platform enables music video creators to battle with other creators or participate in dance contests and earn stars. There are thousands of songs and movie excerpts to choose from, so you can just pick a song you like and use the app's lip-sync and dance mechanics to make incredible videos. After you finished recording you can slow down your clips or use effects such a Black and White or Shine. You can share each video you make with the MuStar app to all popular social media platforms, which can help you get more followers. Even though the app can be downloaded from the App Store or the Google Play Store for free, if you want to use it on a constant basis, you'll have to choose your preferred subscription method. Creating a great soundtrack with Music Video Maker is simple because you can just select a song and cut or trim the parts you don't want to use in the video. The app's video editor lets you apply effects, add frames and text overlays, while you can also import as many as sixty photos from your camera roll and turn them into an HD video. However, the Music Video Maker is primarily a photo editor, which means that it lacks some of the frequently used effects that are commonly used in music videos that are posted on TikTok and other similar platforms. The app contains ads, which can slow you down during the video editing process. Despite all of these downsides, Music Video Maker app still offers powerful tools that enable its users to create music videos quickly. The app's user-friendly interface makes it easy to create and discover music videos. Downloading Fideo Music Video Show will make you a part of the global community of music video makers, so you can become friends with like-minded people and follow their work. The process of making a music video with Fideo is straightforward since you only have to select a song from the app's music library that contains thousands of sounds and songs and record the lip-sync video. The video editing features enable you to polish your videos in any way you want and share it with other Fideo users to get likes and comments. Even though the app offers a decent amount of video editing options, it lacks the cool visual effects, apps like TikTok Including Musical.ly or Video Star offer. What's more, Fideo's file sharing options are limited as you can't share your videos on other social media networks. Choose from Free, Cinematic or Pop music categories, among others and start creating your own music video. This iOS-based app lets you choose the video clip from a camera roll and edit it using its powerful tools. Video Maker with Music Editor also lets you record your own voice or use sounds and songs from your music library. You can add as many music tracks to your videos as you want, which means that you can combine two or more songs in a single clip. The app also features the fade-in and fade-out effect, so you can make smooth transitions between two songs. Sharing your favorite videos to Instagram or Facebook directly from Video Maker with Music Editor app, is easy, while you can also save your videos to your camera roll. The free version of the app contains only the basic music and video editing options, and in order to gain access to all features, you must select one of the available subscription plans. Choosing a video maker app is much easier if you know what type of videos you want to produce. If you want to make short music videos lip-syncing features or the size of the music library the app offers should play a large role in your decision, while video editing tools should be your first priority if in addition to music videos you also plan to make vlogs or fashion videos. What is your favorite app for editing music videos? Leave a comment and let us know.